Social proof is sometimes misunderstood. Not in the fact that people aren’t sure what it is—most know that reviews count as social proof—but in the fact that many don’t realize just how extensive the possibilities for presenting social proof are. That’s why we gathered together some of our favorites, so we can show you the many different ways you can convince buyers that the whole world loves your products. We can’t have a best-of list without ModCloth, can we? Yes, ModCloth provides social proof in several different ways, including reviews and a heart button. It’s easy for buyers to see which products are universally loved, which in turn helps them make up their minds. Lots of companies do this now, though. 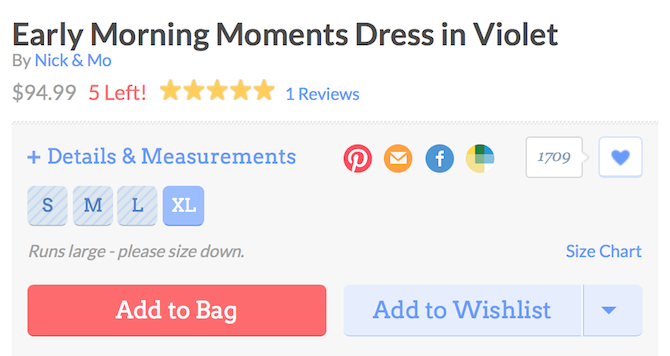 Getting reviews and likes definitely helps, but ModCloth takes it a step further by requesting user-generated content. These images of real customers wearing the clothes and accessories sold on the site have more sway over buyers than picture-perfect models. As an added bonus, ModCloth also presents several different styles for each piece they sell. It’s a win-win. As a global brand with consumers on most continents, opening up social proof to the masses would quickly clog the website. Fortunately, social proof doesn’t just come from the everyday consumer, and Puma knows this. With endorsements from celebrities, brands get a boost in the eyes of buyers. Puma knows this, and that’s why they feature hero images with their top endorsers. They don’t stop there, though. 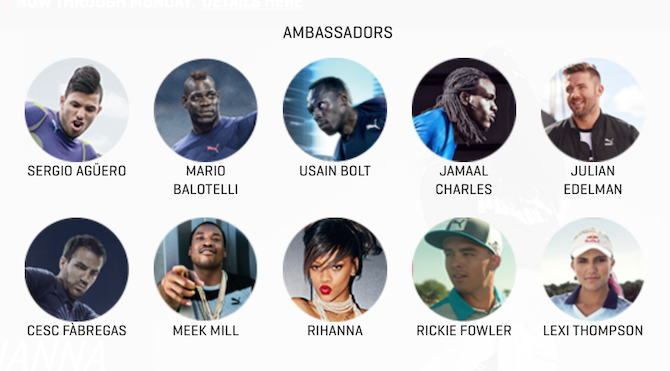 Rihanna and Usain Bolt feature prominently, but buyers can also find a list of other celebrities that trust Puma to be their shoe of choice. If Rihanna likes them, why shouldn’t we? Accepting and even embracing bad reviews isn’t easy. Amazon manages to not only do both but to also make those bad reviews work in their favor. They understand that consumers want to know the bad and the good. We’re smart enough to take everything in context before making decisions. Look how they place the negative and positive reviews together so buyers can see everything at once. They can determine if the good outweighs the bad or if the bad review was from a buyer who just didn’t get what was expected. This is a great way to use even negative social proof to get a positive response. 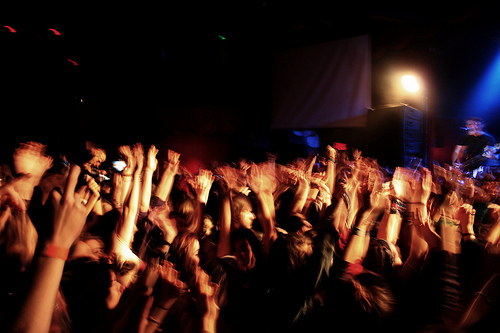 Crowdfunding is a special kind of social proof that’s still gaining in popularity. Betabrand has taken the crowdfunding phenomenon and taken it to a whole new level. In addition to the serious social proof that comes with funding a project for production, Betabrand also includes a few other cues. Take a look at these sunglasses, which have raised almost four times the original goal. There’s a big sign that people love the glasses. If that’s not enough to convince you, there are 48 comments from prospective buyers that might just convince someone who’s sitting on the fence. First, there’s the search result page. See the star rating, followed by the thumbs-up symbol, and then finished with the 398 favorites heart. On the right side, there’s a pretty high rating that’s taken from 394 reviews. That’s all exciting, right? What about the notification that one person is looking at the hotel besides you? That adds a bit of urgency. Add to that the fact that the hotel was booked by someone else less than an hour ago, and that there are only two rooms left, and Booking.com has created a situation where you’d be silly NOT to buy. 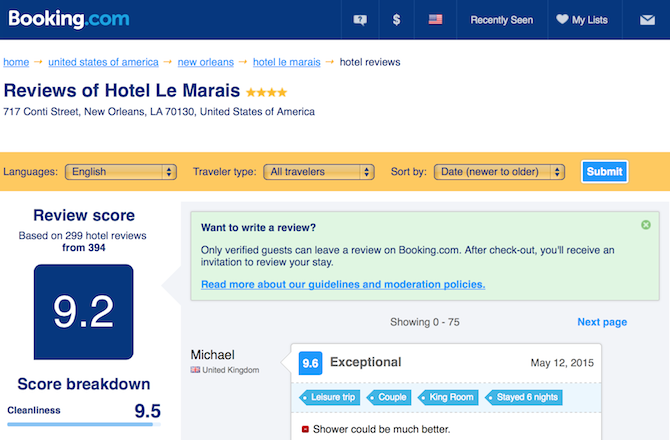 Once you click into this particular hotel to learn more, you can see a breakdown of the scores and the actual reviews. Booking.com makes it clear that only verified guests can leave a review, so you know you’re getting accurate information from real customers. That’s social proof you can’t buy. Are you using every form of social proof available to you? We’d love to know how your efforts have helped your ecommerce sales, so leave us a comment!